Contemporary German cooking couples hearty regional traditions with the subtle, light, and more sophisticated tastes of the modern palate. Jean Anderson and Hedy Würz lead readers from the back roads of Bavaria to the vineyards on the Moselle, from a quaint subterranean tavern in Lübeck to the three-star restaurants of Munich, opening kitchen doors and kettle lids to reveal modern Germany's gastronomic triumphs. With explanations of ingredients, clear instructions, and evocative introductions to the recipes, the cooking of today's Germany is illuminated for American cooks. All the traditional dishes are here, many in their original robust versions and others cleverly lightened by German's new generation of chefs and home cooks. Potato salad, barely glossed with dressing, then greened with fresh chevil; sauerkraut teamed with cod; and pumpernickel reduced to crumbs and folded into an airy Bavarian cream are just a few of the creative new German dishes that nevertheless bow to tradition. A chapter on wine and beer by Lamart Elmore, former executive director of the German Wine Information Bureau, completes the picture of Germany's total gastronomic experience. Germany today is a land of contradictions, a land where meandering rivers run alongside autobahns, where castles and cuckoo clocks coexist easily with high tech, high fashion, and haute cuisine. 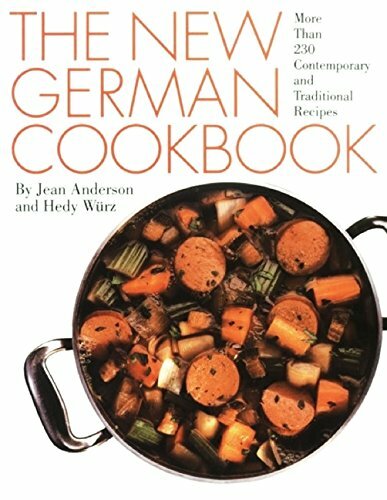 German food reflects this rich tapestry, and in The New German Cookbook, Jean Anderson and Hedy Würz import and interpret the traditional and the subtle, flavorful, and sophisticated dishes of modern Germany for American cooks.